This historic (B rating) homestead has been in the family since it was moved to its current site in 1885. It was run as an accommodation house by my great grandmother Jane Morris, then after her by her daughter-in-law (my grandmother) Kathleen Morris. This apartment was completely renovated in 2016. Feel as though you have stepped back in time as it is beautifully and comfortably decorated in traditional style. It certainly has the WOW factor. Nice and cool in the summer, and cosy and warm in the winter. It is located on the beach front at Opua. Wake up to the sound of sea gulls and stunning views over the Bay. Opua is a very quiet small township, but there is always something happening. Sit on the verandah and watch the activity. Only 100 metres to the car ferry and general store, another 100 metres to the marina and cafe. By road, it is only 5 kilometres to Paihia or Russell. A fantastic walk between Opua and Paihia following the coastal walkway, with other lovely walks only a short distance away. It is also a great starting point for the Opua to Horeke bike trail. 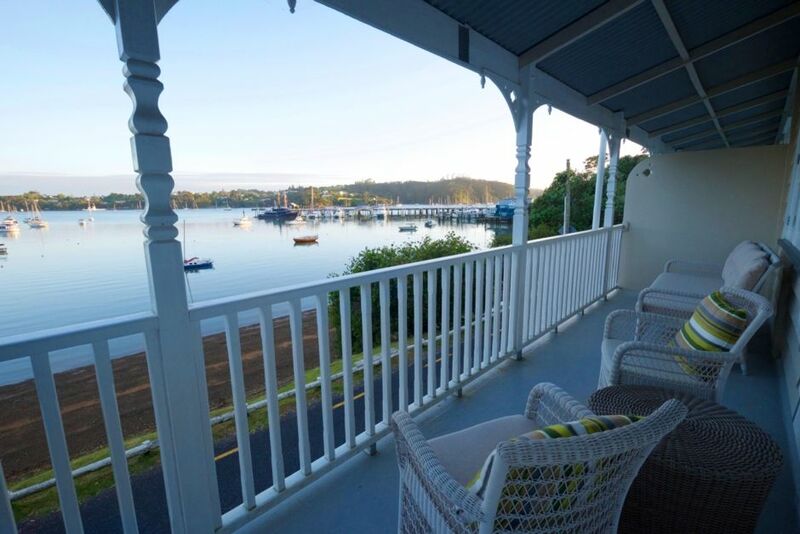 Simply the best place for a relaxing, rejuvenating holiday and a perfect location from which to explore the stunning Bay of Islands and the Far North. Please note there is another apartment downstairs that sleeps 4 people. Please see the separate listing. No smoking anywhere on the property either inside or on the grounds - this is due to the historic rating and age of the building. No naked flame allowed (i.e. lighted candles). No pets. Only one vehicle per apartment in carpark. On-road parking available just up the road. Mother, Grandmother, Wife. My interests are family, travel and photography. This property has been in the family since it was first shifted to this site in 1885. Because of the historic connections it is very special to me and I want to keep it well maintained for future generations. Historic 1885 homestead decorated in keeping with age, but supremely comfortable. This apartment has a lovely balcony from where guests can sit and watch all the activities in the harbour. A nice active yet relaxing view. Absolute beach front with narrow road between building and beach. This road services approximately 10 houses. Two sea kayaks are available, but not for the sole use of this apartment. Fully restored interior with all the modern comfort and convenience yet with the traditional decor of yesteryear. The view over the Bay is delightful. Opua is very quiet yet is close to tourist hotspots in the Bay of Islands. During the summer the Bay of Islands is alive with all sorts of leisure activities and exploration of the area. From Cream Trip and Hole in the Rock tours, to Dolphin watching and Cape Brett tours. Fishing tours are available, together with deep sea fishing and lots more.